Prunus persica is a plant from the family of Pink. The homeland of the Peach is considered to be China though it for certain isn't known. The plant got into the Europe through Persia, from here, by the way, and the name of a fruit went. 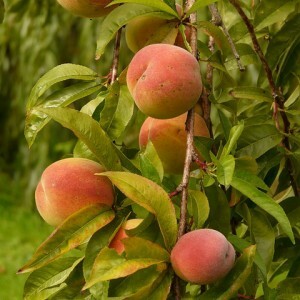 For the purpose of receiving fruits the peach tree is parted in the Southern Europe, warm regions of Asia and America. The peach is widely eaten as fresh, and in canned food, in the form of jam and juice, and of stones make liqueur – a peach. The peach tree is extraordinary beautiful in color (some grades blossom to a half moon) and it is considered an ornamental plant. And its reddish solid wood is used for production of turning and metalwork tools. In our country the Peach wasn't widely adopted, probably, in view of the fastidiousness to weather conditions yet. But selectors successfully work on removal of regional grades which are more adapted for frosty winters and late spring frosts. Having chosen a suitable grade for a certain region and observing recommendations about the correct courting behind a plant, it is possible and in our latitudes for 3-4 year to receive a good harvest of juicy, tasty and infinitely useful fruits. Peach. Peach cultivation. Garden encyclopedia.